Posted in FPMT News Around the World. Ven. Kabir Saxena and Hari Om, MPT Healthcare Program staff, offer basic health education to villagers, Kushinagar, India, March 2014. Photo courtesy of Maitreya Project Trust. In March 2014, Maitreya Project Trust (MPT), the organization responsible for constructing a very large Maitreya statue in Kushinagar, India, began offering basic medical services to villagers affected by the project. The MPT Healthcare Project, one of MPT’s social programs, purchased a large van and toured the countryside, offering basic education on hygiene and alcohol abuse, and forming partnerships with village officials. The van will travel to Delhi to be converted into a fully functioning mobile clinic and soon doctors, nurses and support staff will be hired to expand MPT Healthcare Project’s services and outreach. This September, MPT collaborated with Kushinagar District Magistrate’s Office to begin distributing 3,500 mosquito nets together with reading material about malaria and other infectious diseases. 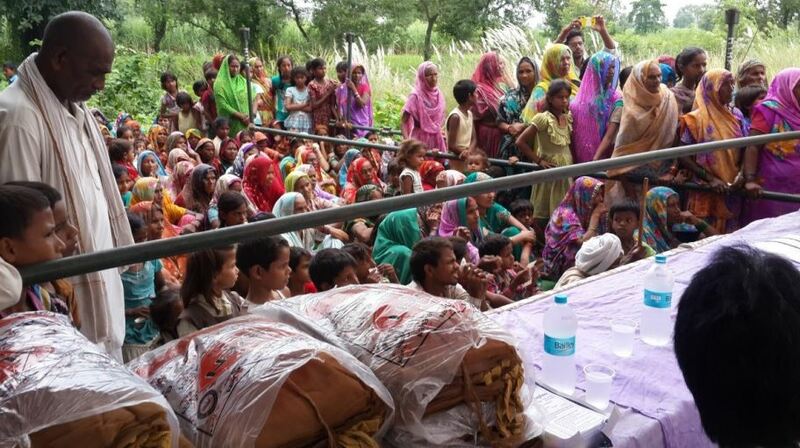 Hundreds of people lined up to receive the first 1,000 nets during the inaugural health camp, and many more are expected to come in October during the second. 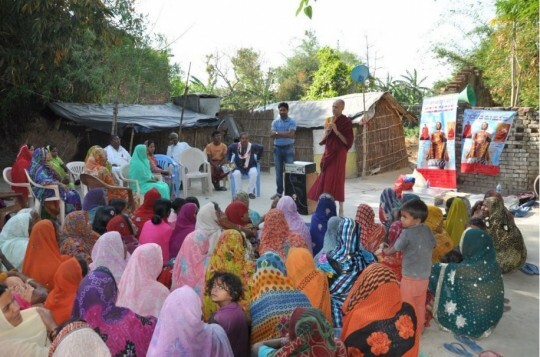 At the advice of Lama Zopa Rinpoche, MPT is making plans to distribute 3,500 wool blankets in December, when temperatures can dip to 40°F (4°C), to the area’s poorest. Progress continues being made on the statue itself, with MPT staff estimating that they will be able to receive 200 acres of land by the end of 2014 and begin the long process of fencing the boundary, setting up their office and welcoming a 24-foot (7-meter) Maitreya statue from Bodhgaya to Kushinagar for auspiciousness. MPT Healthcare Program distributes 1,000 mosquito nets to Kushinagar residents, India, September 2014. Photo courtesy of Maitreya Project Trust. More about Maitreya Project Trust and its accomplishments can be found in its October 2014 update. You can support Maitreya Project Trust, including the MPT Healthcare Project, by visiting FPMT.org. Mandala brings you news of Lama Zopa Rinpoche and of activities, teachings and events from over 160 FPMT centers, projects and services around the globe. If you like what you read on Mandala, consider becoming a Friend of FPMT, which supports our work.